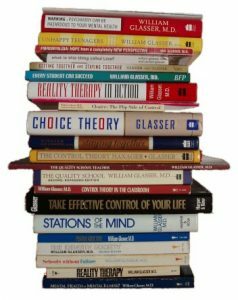 The William Glasser Institute works with organizations, such as schools and businesses to help staff replace external control psychology with choice theory as the psychology that drives the system. In practice, this means moving along a continuum toward lead-management. Lead managers continually work on the system to create a non-coercive environment which encourages employees to self-evaluate and achieve quality work. However, it is essential that the lead manager is able to persuade employees to continually upgrade their system of communicating to one that builds trust. Lead Management is the application of Choice Theory to any situation in which one individual is responsible for managing others. It is a philosophy of democratic management that can be employed in any organisation, business, or educational setting. Lead Management is fair, firm, and friendly. The major focus is on creating a cooperative system with the belief that if people are treated well and understand what their task is, they can be trusted to do a good job. Thus, lead managers take as their agenda the building and sustaining of a perception of personal worth in others without the use of coercion or reward. The only means through which this can be achieved is through a thoroughly integrated grasp of internal control and the techniques that enhance this integration. In most cases, individuals attempting to implement lead management will have been indoctrinated into the mental models and behavioural forms of external control. Thus, for most students of lead management, a complete paradigm change is needed. This paradigm change will mean a shift in pictures, perceptions and behaviours. A reconstruction of the individual’s system that is grounded in the real work of leadership as it is enacted. The only way any organisation will achieve its goal – quality work – is if the lead manager can persuade those in the organisation to continually upgrade the system by communicating in ways that build trust. Indeed, the potential of lead management is such that it generates the conditions under which human beings thrive. Where there are thriving human beings there is innovation and increased productivity.